Andrew Lawrence of Gentleman Scholar Signs. 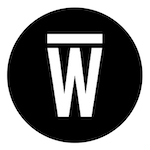 A featured creator on Wescover. I rolled up to his studio deep in the city on a summery hot day, he greeted me with a huge smile, NPR playing from his phone in the background and his hot coffee sat in a sealed thermos right next to a sign he was painting. I could tell this was a down to earth guy, not at all what you’d expect from someone so talented. The stroke of Andrew’s brush is as elegant as classical music played by a symphony at the Royal Albert Hall, you don’t expect someone who creates these sort of signs to have such a relaxed attitude. He doesn’t take himself too seriously and perhaps that sense of humility is what allows him to achieve what you see. 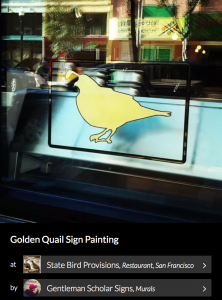 Golden Quail Sign Painting by Gentleman Scholar Signs. Seen on Wescover. Andrew was a door-to-door salesman before becoming the gentleman scholar we know. I asked if knowing the hustle of selling a product to people for so long had helped him become business savvy enough to get him into so many of the greatest restaurants. He replied that in fact there was no connection. 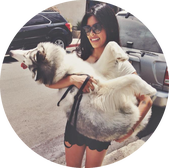 “I’m lucky to be a part of a community where word of mouth travels quickly. With there being so few people who do what I do I can get more calls about doing signs for people.” But see, these aren’t just “people.” Granted, he makes signs for homes, and residential clients but these “people” are actually some of the best restaurants in the nation. People from allover the world flock to State Bird Provisions, The Progress, COI, Petit Crenn and the many places where you’d be lost were it not for Andrew’s signs. So what is a Gentleman Scholar? In short Andrew says: “It was as a nom de plume I chose a long time ago, it’s an incredibly hard to remember/type name but basically It’s about being a nice guy sign company.” Side note: I’ve misspelled the word ‘about’ more times than I’ve misspelled Gentleman Scholar. And is he a scholar? He actually is! Andrew studied sociology and got a masters…kinda. The story is long and a bit complicated but suffice it to say he has a masters in sociology, kinda, and we are lucky to now see his work as a sign artist. Andrew Lawrence of Gentleman Scholar Signs. 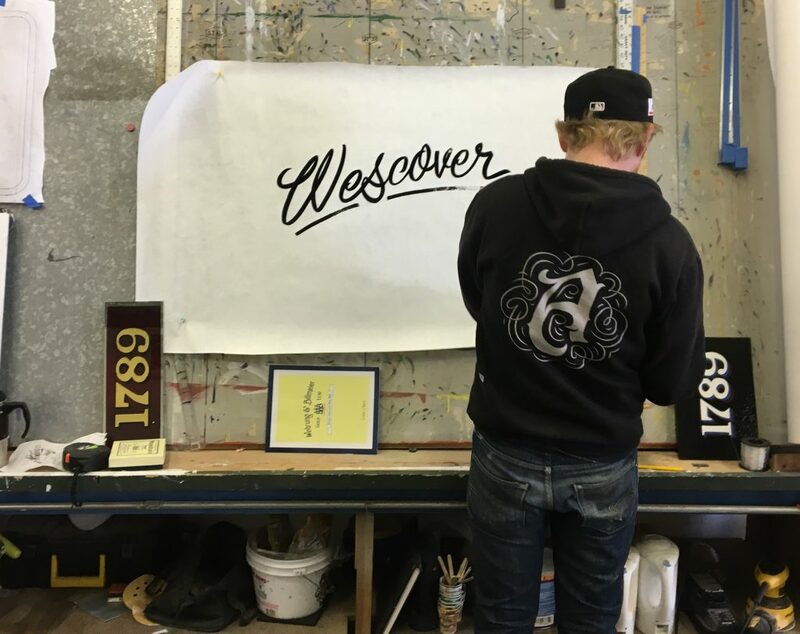 A Wescover featured creator. Andrew works out of a chilly studio where I got to see some of his new, in the works, and previous signs. 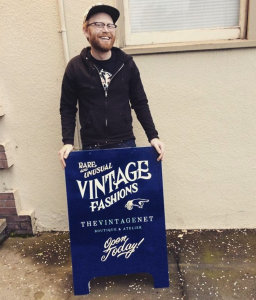 As we know from above, Andrew created the sign for State Bird Provisions and their sister restaurant The Progress. When I asked what his connection to those restaurants is he went on to share a bit about the owners and chefs of the two but what really got him talking was the history of the space. He mentioned that The Progress was a cinema back in the good old days, from 1911-1925 to be exact. It was a part of the trio of theaters owned by Kahn and Greenfield– in addition to the New Mission Theater, and the New Fillmore Theater. “The private dining room at the Progress was likely the projection room. Once you realize the space was a theater and have walked through all the passages it’s past completely comes together” said Andrew. To ease your curiosity, The Progress was later rehabed and reopened, then finally became what we see today. His favorite piece in the space is actually by another Wescover artist, Leah Rosenberg. He said it was an awesome piece that really added to the space and injected a bit of whimsy. I asked about his inspiration though he was frank and straightforward in his answer: “As a sign painter you don’t always get to be creative. You’re often given a logo or have to follow their branding so not much else beside technique goes into it. But of course I still love what I do. When people come to me, they often do want my creative input though and I do love to design too. Sign painters were in many ways America’s first graphic designers so that’s a legacy that I like to carry on.” So what do you do for fun? “I like to go fishing pretty much every day if not four or five days per week. I like to get away from the buzzing of the city and just relax for a while. What would you be if you weren’t a sign painter? “A carpenter!” Do you do any carpentry? Not at all” he says with a chuckle. I went to a tiny town in England once where the Lord of the town had created cheeky plaques and placed them in random spots like a forest trail, upside down on the wall of a cottage and so forth. It reminded me with its wit that as humans we are always looking for signs. You can recognize a logo or a stop sign, a header for a market or the signature of your favorite artist but fundamentally it is signs that show us the way. One of the plaques reads “If you’re looking for a sign, this is it”– that is definitely elemental knowledge.